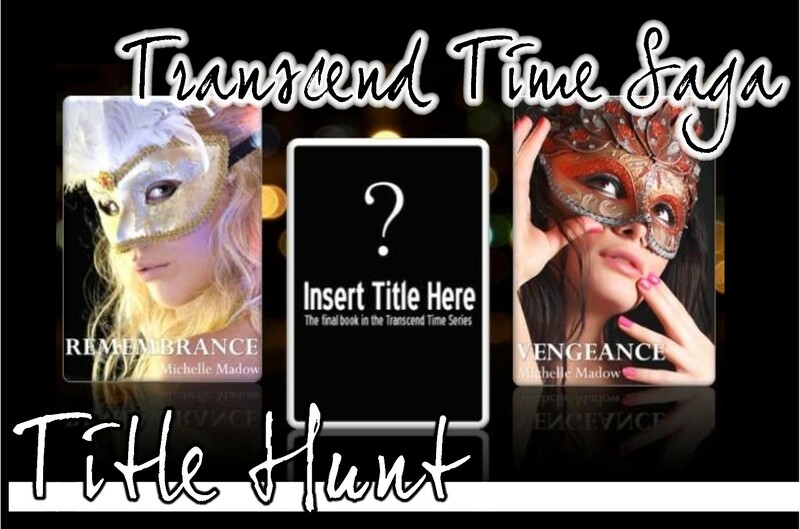 Michelle Madow: Final Transcend Time Novel Title Hunt! Welcome to the Title Hunt for the Final Transcend Time Novel! The title hunt is the reveal of the title for the final novel in the Transcend Time Saga. Each of the bloggers participating in the hunt have been given a letter. Hop around to the blogs participating to hunt for the letters. (And remember that two of the letters are used twice, so the title is eight letters long.) The list of the blogs participating is at the bottom of this post. Once you've unscrambled the title, come back to my blog and use the title name to enter the giveaway for a voucher for an advanced e-copy of the final Transcend Time novel! (I am giving away a voucher because the novel is planned to be released at the end of the year, and I haven't finished writing it yet! This voucher will ensure that you will receive an advance e-copy once they are available). Also remember that in a celebration of my USA tour (I'm traveling the country speaking to high school students), the e-version of Remembrance is on sale for $0.99 until I return home in April! Be sure to get your copy before it returns to its original price. Buy it on: Amazon and Barnes & Noble. Enter to win an advanced e-version of the Final Transcend Time novel!